One of the most loved couples of tinsel town -- Indian skipper Virat Kohli and Bollywood actress Anushka Sharma - is receiving immense love from all over the world since the duo tied the knot in Italy on 11 December. The most-awaited wedding of 2017 took place in Italy at a countryside resort named Borgo Finocchieto, one of the most expensive holiday properties in the world. 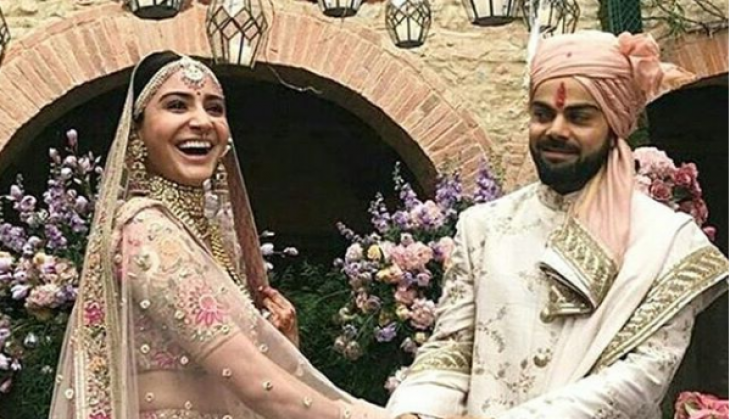 A string of congratulatory messages from the cricketers and members of the sports fraternity have showered their warm wishes to the newlyweds. Taking to Twitter, legendary cricketer Sachin Tendulkar congratulated the power couple and said that they took look really good together. "Congratulations and best wishes to the just married @imVkohli and @AnushkaSharma. You both look wonderful together. #Virushka," former Indian opener Tendulkar wrote. The Board of Control for Cricket in India (BCCI) also extended their heartiest congratulations to the `lovely` couple. "Heartiest congratulations to this lovely pair. Wishing the couple a very happy married life," the country's cricket board said. First drop Cheteshwar Pujara, who was part of the Test squad that clinched a 1-0 victory over Sri Lanka in the three-match series, also felicitated the couple on their wedding. "Best wishes to both of you on your wedding @imVkohli & @AnushkaSharma. Wishing you a life filled with all the blessings and joys of life," wrote Pujara on Twitter. Best wishes to both of you on your wedding @imVkohli & @AnushkaSharma. Wishing you a life filled with all the blessings and joys of life. Harbhajan Singh: Jug jug jeeve eh sohni Jodi ..@imVkohli @AnushkaSharma rab hamesha khush rakhe. Shoaib Akhtar: Wishing @imVkohli and @AnushkaSharma all the best in the new innings of their life #viratanushka #congrats. Shahid Afridi: Congratulations @imVkohli @AnushkaSharma on your wedding. May God Bless you two and give you happiness and a rewarding married life. The wedding was performed as per Hindu rituals. Top fashion designer Sabyasachi Mukherjee has designed the wedding ensemble for both the bride and the groom. The wedding took place at a countryside resort named Borgo Finocchieto, one of the most expensive holiday properties in the world. The property is located in a small village called Bibbiano - having a population of less than 100 people. It is in the Tuscany region of Italy. The couple will travel to South Africa where Virat will start preparing for the upcoming series and Anushka will spend New Year's Eve with him and return in the first week of January to begin the next schedule of Anand L Rai's film with Shah Rukh Khan in Mumbai. She will also start preparing for 'Sui Dhaaga' as the shooting for the same starts in February 2018 with Varun Dhawan. Anushka will also be busy with the marketing and promotions of 'Pari' which is releasing on 9 February. Post their wedding, the newlywed couple will be shifting to their new residence in Worli, Mumbai in December once they return from Delhi.